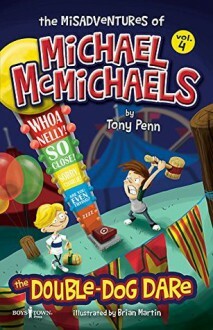 When wealthy new student Zeke moves into the neighborhood, he threatens to steal away Michael's best friend Kenny. Green with envy, Michael challenges Zeke to crazy double-dog dares just to prove he's still top dog and Kenny's best bro. But when harmless dares escalate into bad jokes that hurt others, Michael has to figure out how to make things right again]] or if he even can. Grades 1-5.